The capital city of Rajasthan, Jaipur, is the concentre of innumerable stories of valour, courage and Rajputana honour. A stroll in the streets of Jaipur, brings to you, a different part of the city that one might not realise as they consider the modern houses and schools that overtly represent the city’s base. The one that is vehemently different from all others. Jaipur was built in 1727 by Maharaja Sawai Jai Singh II and has derived its name from the founder. One of the finest monuments & key attraction of Jaipur is the Amber Fort which was declared a UNESCO World Heritage Site in the year 2013 in the category of ‘Hillforts of Rajasthan’. Amber Fort is the perfect example to suggest how Jaipur’s history is not restricted simply to the acts of valour by its kings and soldiers, but also extends to the patronage of architecture and science, as reflected in the construction of this marvellous fort and also the entire city. Famously known as the Pink City, Jaipur is surrounded by hills on three sides which made it an ideal location for the capital of the Rajputana empire. Jaipur, as part of the ancient kingdom, was ruled by the Kachhwaha clan of Rajput. They had been in an alliance with the Mughals over their common rivalry with the Sisodia clan of Rajput. Jaipur was, historically, India’s first planned city. Maharaja Sawai Jai Singh patronised the construction of the city as per traditional Rajputana architectural style. Vidyadhar Bhattacharya, the chief architect from Bengal was responsible for ensuring that the layout of the city was based on the principles of Shilpa Shastra, the same principles were also followed during the construction of Amber Fort. The primarily important buildings were built of sandstone, which is found in abundance in the state. Amber fort or Amer Fort is located at about eleven kilometres north of the city of Jaipur along the NH-8. The fort was constructed on the Kalikho hills formed by the Aravalli ranges. The fort was tactically built amidst the Aravalli ranges along with the Maotha lake and the Sagar lake. Numerous points along NH-8 provide a breathtaking view of the fort as it is mirrored simultaneously in the Maotha Lake. The fort was established in the 16th century by the Kachhwaha rulers but only after they had destroyed the older structures that had been constructed by the Meena clan. The primary attractions in the fort are: (a) Diwan-e-Am (b)Diwan-e-Khas (c)Ganesh Pol (d)Jaleb Chowk (e)Singh Pol (f)Jai Mandir (g)Yash Mandir (h)Sukh Mandir (i) Sheesh Mahal (j)Suhag Mandir (k)Sila Devi Temple (l)Bhool Bhulaiya and (m)Zanana Dyodhi. The construction of the Amer fort first began with Raja Bharmal and Raja Man Singh I in 1558. The fort was completed over a period of two centuries after the consistent efforts of three kings, finally ending in 1727 by Raja Sawai Jai Singh II. Amer fort was designated as the new residence for the royal family as opposed to the older establishment of Jaigarh Fort. However, both the Amer and Jaigarh forts are often considered to be a single establishment due to the common passageway that runs between them. 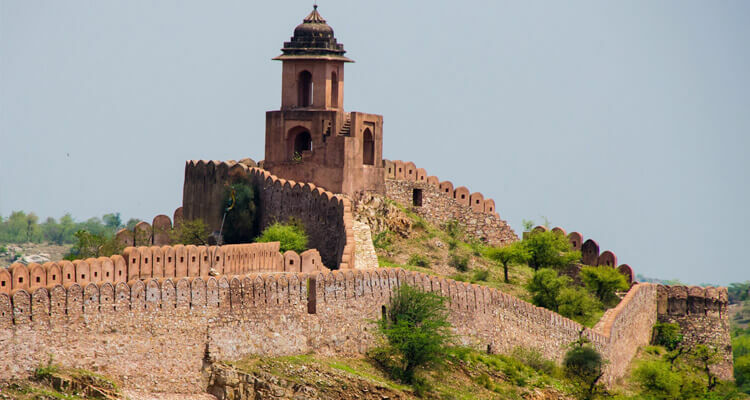 The Jaigarh fort was a retreat for the royal family as well as their attendants in times of war. 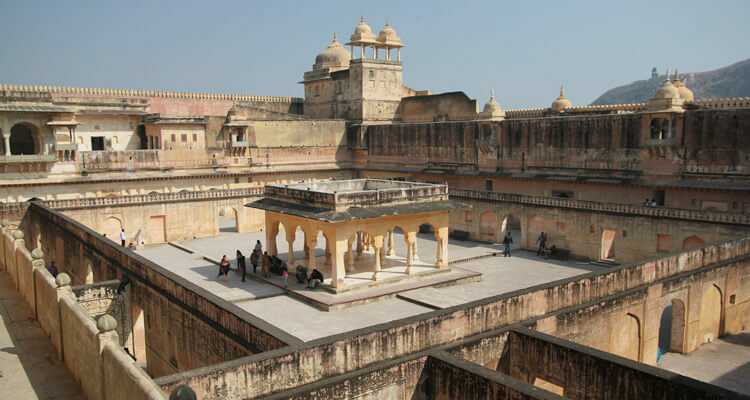 The Jaigarh fort was also known as the Kadimi Mahal or the “old palace”. Amber was earlier known as Dhundar and had been the capital of the Meena clan. The Kachhwaha rulers seized it from the Meenas and began the construction of the Amer fort in the 1600s. There are multiple etymologies provided so far for the name “Amber”. Multiple stories include it being named after Ambikeshwar, the title of Lord Shiva, whose symbolic representation, the linga, was placed in a lake in the center of the Amber. The Jain inscriptions of the 16th and 17th centuries talk about the derivation of the name from the name of Goddess Ambavati. Another tale claims that the name was derived from Amba, the universal mother. Although there exists no inscription validating the fact that a war was fought by the Kachwaha and the Meena's during which the settlement came under the Kachhwaha rule, however, according to a popular folklore, Dhola Rae, the adopted nephew of Raja Alan Singh, the then ruler of Amber, slaughtered the Meena clan on the day of Diwali. The Kachhwaha clan is believed to be the descendants of Kush, the second son of Lord Ram. One of his descendants was Raja Nal, whose son, Raja Sora Singh was killed in a war. His widow was found plucking wild berries by a Brahmin who, after looking at the baby, predicted a bright future. She then sought refuge in the kingdom of Khogong, presently known as Amber, which was led by Raja Alan Singh. He adopted her as his sister and the child, Dhola Rae as his nephew. At the age of 14, Dhola Rae was sent to Delhi to learn about politics. Upon his return, he brought his own army of Kachhwahas to claim the throne of Amber. According to a ritual called Pitra Tarpan, the Meenas had to set their weapons aside and taking advantage of this opportunity, they were attacked and the settlement of Amber came under the Kachhwaha rulers. The construction of the fort first began in 967 AD with Raja Man Singh I of the Meena dynasty, however, almost all the structures built by the Meenas were demolished before new construction began in the 16th century. The fort was constructed out of red sandstone and white marble which represents a blend of the Hindu elements along with a Mughal influence. The sun gate or the Suraj Pol was named so because of its positioning. The gateway faces east and therefore, witnesses the sunrise in the morning. Entering from the Suraj Pol, one reaches the Jaleb Chowk. Rulers along with the soldiers entered through here with their procession after the war. This courtyard was where the soldiers celebrated their victories under the commander of the army, known as Fauj Baksh. Women viewed the celebrations from the windows, called Jharokhas. On the right of the Jaleb Chowk is the Sila Devi temple. The temple has intricate marble carvings along with a double door entrance that is covered with silver. The idol inside the temple was presented to Raja Man Singh by the ruler of Jessore, Bengal in 1604 after their defeat. Animals were sacrificed in front of the temple on the eighth day of Navratri as a ritual, however, this ritual was eventually banned recently. Above the gateway was the Suhag Mandir where only the royal women were allowed to offer their prayers. A stairway from the first courtyard led to the second courtyard which housed the Diwan-e-Am and the Diwan-e-Khas, i.e., the House of the commons and the House of the Officials respectively. There were 27 evenly divided columns on a raised platform, with an elephant-shaped motif at the top of each pillar. In the Diwan-e-Am, the rulers listened to and addressed the problems faced by the common people, whereas, the Diwan-e-Khas was restricted for official state policy matters only and concerns regarding to taxes, revenue, security etc. were discussed here with a very select audience, restricted only to the ministers of the concerned subjects. Atop Diwan-e-Khas was the Jai Mandir which was decorated with floral glass tiles, representative of the Mughal influence. Entering from the Ganesh Pol, one comes across the residence of the royal family members and their attendants. The walls are covered with mosaic and engraved sculptures. This courtyard houses the famous Sheesh Mahal built by Raja Man Singh II in 1727. Victories and festivals were celebrated here. The walls of Sheesh Mahal were covered with concave mirrors due to which, the entire palace was illuminated by just a few candles. Opposite Sheesh Mahal was the Sukh Mahal which had a sandalwood door. The building was largely air-conditioned due to the channels built along the walls. These pipes were regularly supplied with water from the Maotha Lake. Above the gate is an engraving of the Magic Flower. It could, however, be viewed only after the panel had been partially hidden. 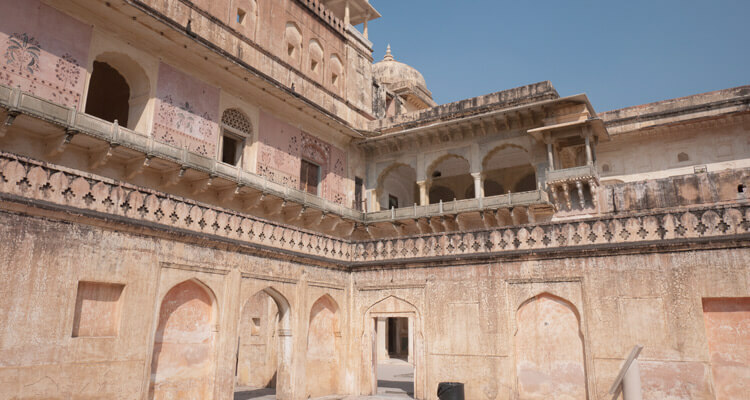 The palace of Raja Man Singh I is also situated in the third courtyard and is the oldest structure of the court. It was completed in 1599 and had taken over 25 years to be completed. The exit from this palace had a direct route heading towards the town of Amer. As you enter from the Tripolia gate, located in the western part of the fort, the Zanana Dyodhi can be witnessed. This area is intentionally secluded from the rest of the fort. Zanana Dyodhi was the residence of the queens, their mothers, and their attendants. This structure was constructed in a unique way. No one could see the king enter the Zanana Dyodhi and if he stayed with one of his queens, the others would not be aware of it. This was achieved due to its structure. Zanana Dyodhi had a long corridor with smaller corridors leading to the different rooms of the queens. As has been mentioned before, the fort had a unique blend of the Hindu elements from the Shilpa Shastra and Mughal influence. This was evident from the fact that while the Ganesh Pol, had elaborated and detailed paintings, on the other hand, the Sheesh Mahal was the adaptation of Mughal architectural pieces like jharokhas and jalis all inlaid with mirrors, the garden of the palace of Man Singh resembling the Chahar Bagh etc. These were also, sometimes, seen as the symbol of a political alliance. The positioning of forts, palaces, temples, gardens etc in relation to the lakes, ponds, rivers, and step-wells are examples of the brilliance of architecture, power, knowledge, grandeur and the defence technology that the Rajput rulers possessed. The structure of the Amer Fort is reflective of the defensive nature for which the “Garh” was built. Ditch: A wide ditch around the lake is dug for protection from direct enemy attack. 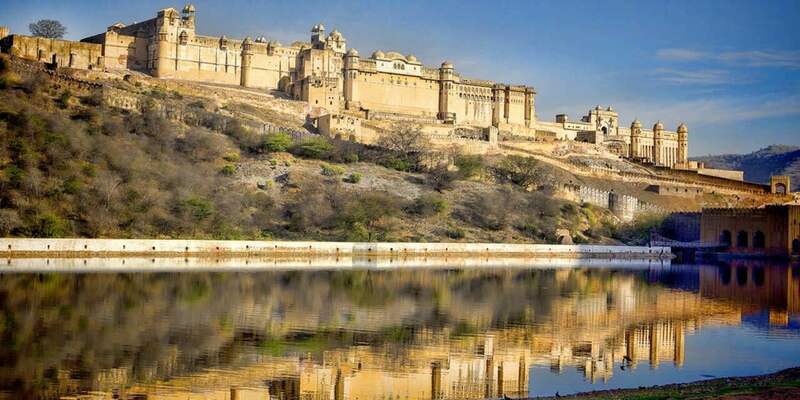 In the case of Amer Fort, the Maotha lake and the Sagar lake served the dual purpose of not only providing water for the residents of the fort, but also of restricting the enemy from entering the fort beyond a certain point. Fortified walls: Generally, a large area was constructed within the fortified boundary of the Garh that served as a retreat for the residents of the fort in times of war. The Jaigarh fort was connected to the Amer fort through a secret passage and therefore, functioned as a retreat. The landscape surrounding the fort was not beneficial only for defensive and offensive purposes at the time of war, but also for providing a resort for the members of the royal family. They could find a recreational space as they saw the scenic views of the landscape from the specific points created for them, such as jharokhas, jalis, chhatri, and terraces. At a time when the collection and storage of water was a major source of concern due to the lack of many of the technologies that we have today, the architect of the Amer fort ensured that no such problem was faced by the residents of the Garh. Water travelled from the lake to a large tank positioned at the bottom of the fort through clay pipes. The tanks allowed the water to be desilted and aerated. The water was lifted to the upper tanks using pulleys and filled into smaller tanks. The water was lifted through the Persian wheel fitted with a number of earthenware buckets. 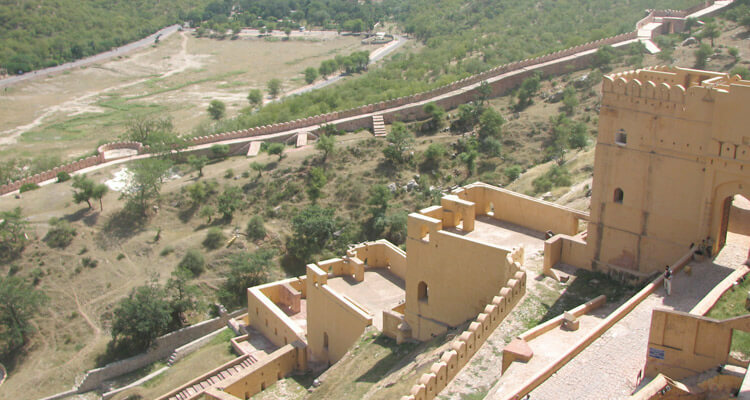 A similar process was followed in the Jaigarh fort as well. Water was carried from the Sagar lake manually. Steps were created from the lake to the fort and people carried water in earthen pots. The pots were passed from one person to another who was stationed on a higher step. The water was filled into a huge tank and was then lifted with the help of a pulley. The water was then allowed to pass through a bed of canals that had a gradient yet undulating slope that allowed the sand to settle while also letting the water to have a swift course. Amber was eventually abandoned by the Kachhwaha rulers as a shift of the capital was thought off from Amber to Jaipur in 1727 by Raja Sawai Jai Singh II. The capital was shifted since Jaipur was considered to be strategically better located allowing the rulers to oversee the frontiers of their kingdom while also ensuring that an attack on them was not as easy. However, Amber was not completely abandoned. The existence of a trade route connecting Gujarat kept the city alive and, in some ways, also helped in the sustenance of the Amber Fort, which escaped the fate that many of the other abandoned forts faced over the course of time. Jaipur was amongst the few kingdoms that never came under direct British rule. Although the royal family continues to reside in Jaipur, the fort of Amber has been completely opened for all tourism functions. 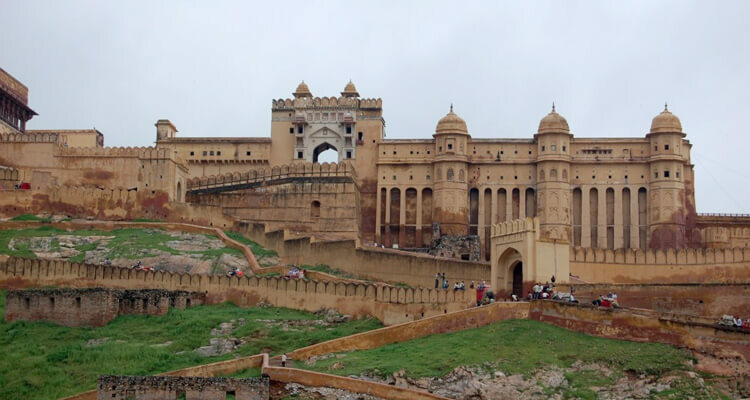 The Amber Fort is a large contributor to the revenue generated from tourism in Amber. It alone entails one-third of the tourist revenue. According to an estimate, approximately forty crore rupees has been spent on its restoration so far. Although movies had earlier been filmed in the fort, the High Court of Rajasthan condemned the filming of movies and further went ahead and restricted such acts after considerable damage was inflicted upon the monument during the shoot of a Bollywood movie. Today, Amber Fort is ranked as one of the top tourist attractions of Rajasthan and was included in the list of UNESCO World Heritage sites in 2013. The history of Amber Fort along with its architectural designs, engravings, technological aspects, and cultural embodiments speak volumes about the royal Rajputs than we are presently, and more commonly, aware of. Yes, it speaks about the valour, courage, passion, and pride of the Rajputs, but that is not what it is restricted to. It also talks about the brilliance and knowledge of architecture, their political alliances with the Mughals and the impact of this alliance. The defence techniques used were reflected in their architecture as well. The history also mirrors the relations that the various Rajput clans and dynasties had with each other. 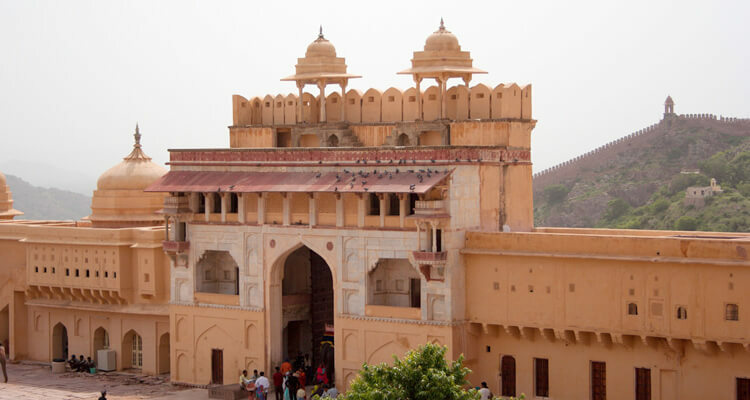 Amber Fort is one the major tourist attractions of Jaipur currently. One can avail either the day or the night tour. While the day tour’s splendour can be experienced through the elephant rides that start from the bottom of the hill and lead right up to the fort, the night tour has a radiance of its own. As the daylight fades away, the yellow bulbs assisted by the moonlight come to the rescue of Amber fort. Although the fee of night tours is higher than those of day tours, the dazzle of the night tours is beguiling and beyond compare. What looks like an abandoned palace in the day is naturally restored to its original grandeur at night. The tours can be accompanied with by a guide who takes one to every nook and cranny of the palace and introduces the history of the fort with specific details about the carvings and engravings on the walls. One can drive up to the bottom of the hill and either walk up to the fort or experience the royal pomp and ride up to the fort on an elephant. Another interesting activity during the night tours is attending the light and sound show. You move away from the fort and are seated at a location which is rightly distanced from the fort to give you a complete view of it. The light and sound show includes the local folklores, tales and myths and slowly accelerate to the history of the fort itself. It reads the chronicles of the kings and the sagas of the wars that were fought. Assimilate the glory of the Rajputana and the royal lives they led.